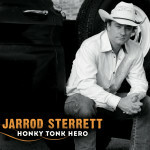 Purchase the new album, Honky Tonk Heroes, on iTunes today! A collection of great country and western songs that will keep you dancing the night away. Jarrod’s sophomore effort brings out great production and musicianship and shows exactly what Jarrod is all about.